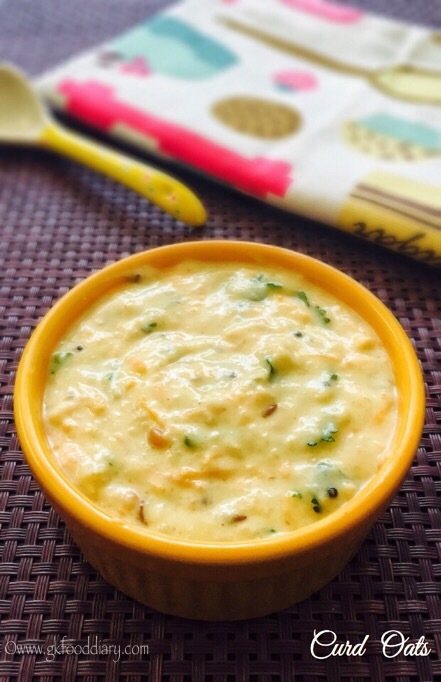 Curd Oats – an easy and comfort dish made with oats, curd/yogurt and grated vegetables. I am trying some different oats recipes recently as I had to finish the oats pack which is nearing expiry. This curd oats is one such try and the method of making is similar to dahi poha which I shared a while back. 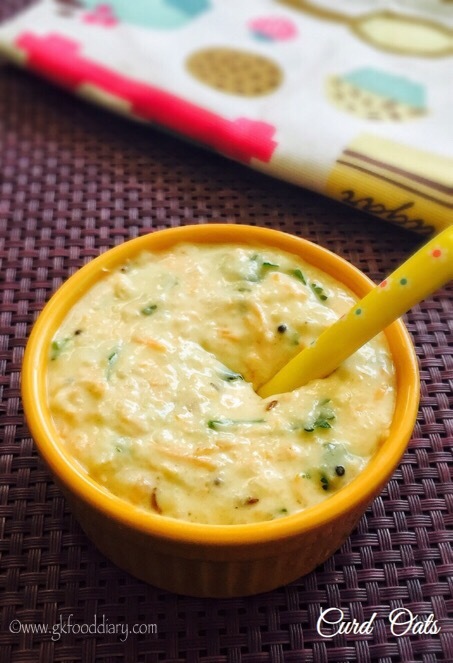 It turned out very tasty and my little one loved it:) I am sure most of the babies like this curd oats for its texture and taste. 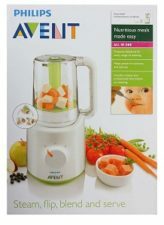 Do give a try and let me know how your baby liked it! 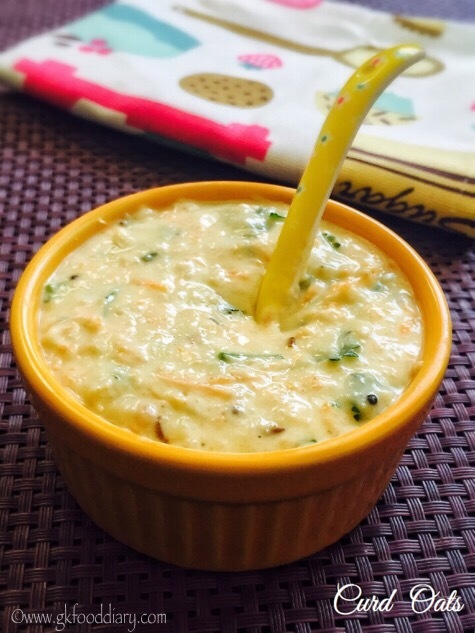 Curd oats can be given to babies from 8 months and also ideal for toddlers as a quick lunch. 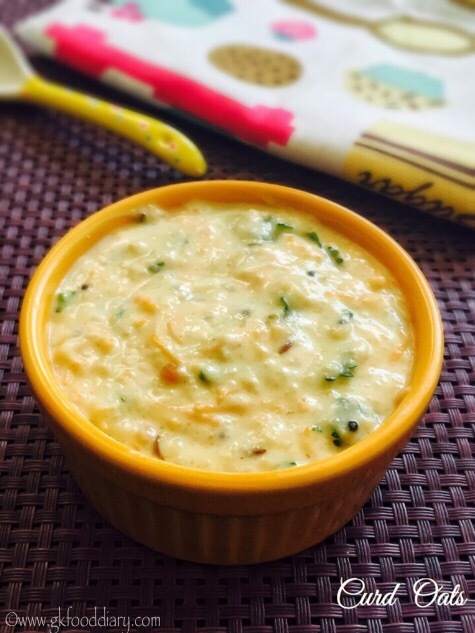 Let’s get on to check how to make this easy Curd Oats recipe for babies, toddlers & kids. Heat ghee in a tadka pan, add mustard seeds, urad dal and cumin seeds and hing. Let the mustard and cumin seeds cracks. Switch it off once done. Set aside. 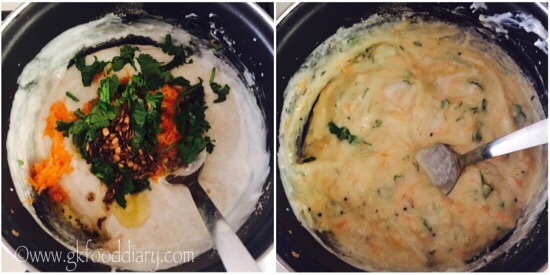 Grate carrots, chop coriander leaves finely. Keep everything ready. Measure oats and curd. Keep it ready along with other ingredients. Take the oats in a pan, add required amount of water. 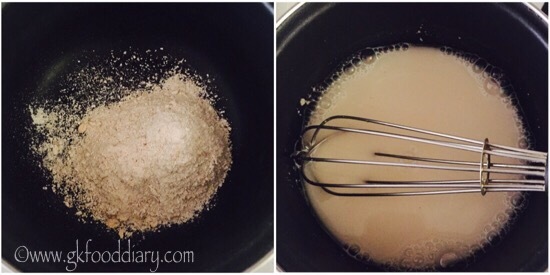 Mix it well with a whisk without any lumps. Cook the oats in low flame for 5 minutes until its thick. Once cooked , switch off the flame and cool it down. Then add the curd to cooked oats. Mix the curd with oats well. Then add salt, grated carrots and the tempering items. Mix everything together with a spoon. 1. Heat ghee in a tadka pan, add mustard seeds, urad dal and cumin seeds and hing. Let the mustard and cumin seeds cracks. Switch it off once done. Set aside. 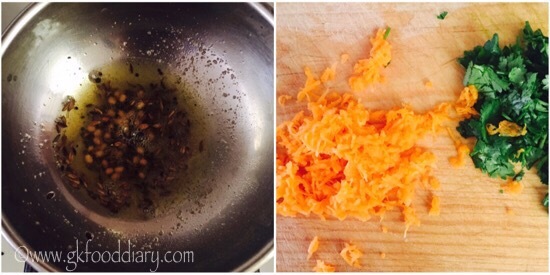 Grate carrots, chop coriander leaves finely. Keep everything ready. 2. 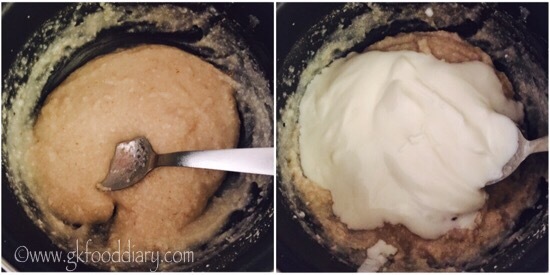 Measure oats and curd. Keep it ready along with other ingredients. Take the oats in a pan, add required amount of water. Mix it well with a whisk without any lumps. 3. Cook the oats in low flame for 5 minutes or until its thick. Once cooked , switch off the flame and cool it down. Then add the curd to cooked oats. Mix the curd with oats well. 4. Then add salt, grated carrots and the tempering items. Mix everything together with a spoon. The tasty curd oats is ready! I used powdered oats, you can use whole oats too. But cooking time vary accordingly. Skip salt for babies below one year. You can also skip the tempering part too. Make sure to introduce each ingredients separate to your baby, before you try this curd oats recipe.